A recent report published by Infinium Global Research on pigmentation disorders treatment market provides an in-depth analysis of segments and sub-segments in the global as well as regional pigmentation disorders treatment market. 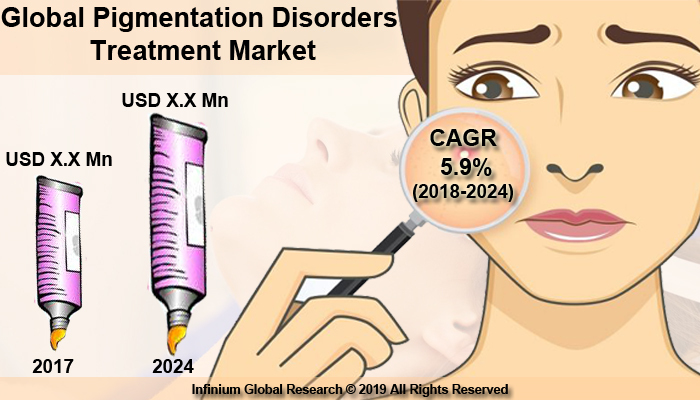 The study also highlights the impact of drivers, restraints, and macro indicators on the global and regional pigmentation disorders treatment market over the short term as well as long term. The report is a comprehensive presentation of trends, forecast and dollar values of global pigmentation disorders treatment market. According to the report, the global pigmentation disorders treatment market is projected to grow at a CAGR of 5.9% over the forecast period of 2018-2024. Pigmentation disorders are caused by a change in the level of the pigment melanin. Pigment melanin is produced by melanocytes. Melanocytes are the cells that are produced owing to the accumulation of other pigments in the skin. Pigmentation disorders include a large number of heterogeneous conditions that are characterized by altered melanocyte density, melanin concentration and result in altered pigmentation of the skin. Skin pigmentation disorders affect many people. In primary care practices, pigmentation disorders are commonly diagnosed, evaluated, and treated. Several therapies, as well as surgeries, are available for the treatment of skin disorders. By disease indication, pigmentation disorders treatment is categorized into hypopigmentation and hyperpigmentation. The rise in the spending on lifestyle as well as rising awareness of people drives the growth of pigmentation disorders treatment market. Furthermore, the rising prevalence of skin disorders fuels the growth of pigmentation disorders treatment market. Increase in aging population and rising people concern to improve the affected skin boost the growth of pigmentation disorders treatment market. Rising demand for pigmentation disorders treatment is coupled with the increasing number of people affected with pigmentation disorders that in turn boosts the growth of pigmentation disorders treatment market. However, the high cost that is required for the treatment may hamper the growth of pigmentation disorders treatment market. Technological advancement in cosmetic therapy and surgery provides beneficial opportunities for pigmentation disorders treatment market. Increasing research and development activities provide favorable opportunities for pigmentation disorders treatment market. Geographically, Asia Pacific dominated the pigmentation disorders treatment market. Growing population and rising awareness of people towards the skin disorders fuels the growth of pigmentation disorders treatment market in the region. Furthermore, rising disposable income and changing lifestyle contribute to the growth of pigmentation disorders treatment market. In the region. In North America, the demand for pigmentation disorders treatment is increasing owing to the increase in the rates of skin disorders. The U.S. contributes more to the rising demand for pigmentation disorder treatment in the region. Advancement in cosmetic therapy such as Laser resurfacing and ongoing research and development on pigmentation disorder treatment and surgeries fuel the growth of pigmentation disorders treatment market in the region. The report on global pigmentation disorders treatment market covers segments such as treatment & therapies, disease indication, and end-user. On the basis of treatment & therapies, the sub-markets include chemical peels, dermabrasion, laser resurfacing, melasma, and others. On the basis of disease indication, the sub-markets include hypopigmentation and hyperpigmentation. On the basis of end-user, the sub-markets include dermatology clinics, hospitals, and others. The report provides profiles of the companies in the market such as Bayer AG, Pierre Fabre Pharmaceuticals, EpiPharm AG, SkinCeuticals International, Galderma laboratories, VIVIERPHARMA, Obagi Cosmeceuticals LLC., La Roche-Posay, and ALLERGAN. The report provides deep insights into the demand forecasts, market trends, and micro and macro indicators. In addition, this report provides insights into the factors that are driving and restraining the growth in this market. Moreover, The IGR-Growth Matrix analysis given in the report brings an insight into the investment areas that existing or new market players can consider. The report provides insights into the market using analytical tools such as Porter's five forces analysis and DRO analysis of pigmentation disorders treatment market. Moreover, the study highlights current market trends and provides forecast from 2018-2024. We also have highlighted future trends in the market that will affect the demand during the forecast period. Moreover, the competitive analysis given in each regional market brings an insight into the market share of the leading players.